Tabasco, aka Gable Tabasco, is a handsome, 11-year-old red fawn male born March 28, 2001. His sire is the late famous Gable Dodge, and his dam is Seegold Panache. Tabasco is brother to Zack, and sire to Moseby and Michigan. 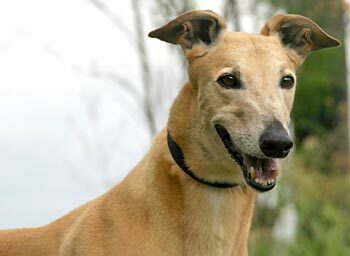 Tabasco’s AA racing career was some time ago, from July 7, 2003, to February 27, 2004, all at Wheeling Downs, West Virginia. 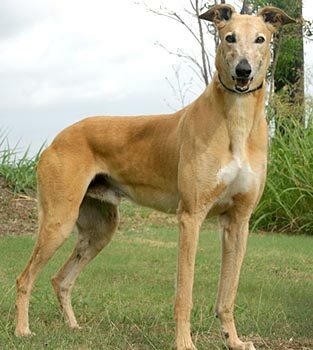 Tabasco went on to be a stud – sire to 184 greyhounds! Those days are behind him, and he is ready to find his forever home. Tabasco is not cat tolerant and has yet to be tested with small animals. He was in a home for a few months, but has since returned to GALT and is ready to start his search again. Tabasco is a sweet and spicy kind of guy. But at age 10 -- despite his enthusiasm for walks, his agility for jumping into an SUV, his occasional interest in chewing apart toys -- he leans more toward the subdued. He's a pooch on a schedule he seems to love, and who wouldn't? Breakfast, snack, nap, potty break, nap, dinner, walk, bedtime. He makes good eye contact and is eager to please. He's not cat tolerant, and during pet-store meet & greets, he seems to have more than a passing interest in ferrets, small dogs and cats. With us, though, he's a lovable bear who chatters his teeth when he's happy (which is quite often). He's tall, so the occasional cookie on the counter is within reach. Mostly though, he prefers chew toys or something beefy for snacks. He's a big boy needing a big crate, but he normally prefers to lounge on a dog bed near us. 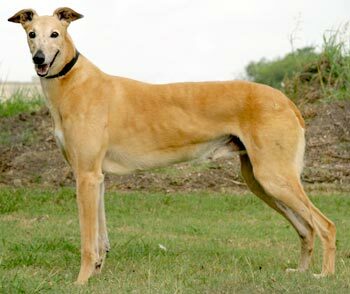 Tabasco had an active life racing and living on a farm -- and, can we say, siring 184 offspring! -- so understandably, at times his back seems a bit weak. For that reason, quite possibly, he tends to avoid stairs. We'd recommend a house without them, as well as a family without small children. But mostly, we'd just recommend Tabasco. He's a sweetheart, and whoever welcomes this fawn into their home -- well, we won't tell anyone if we hear them chattering their teeth in happiness.